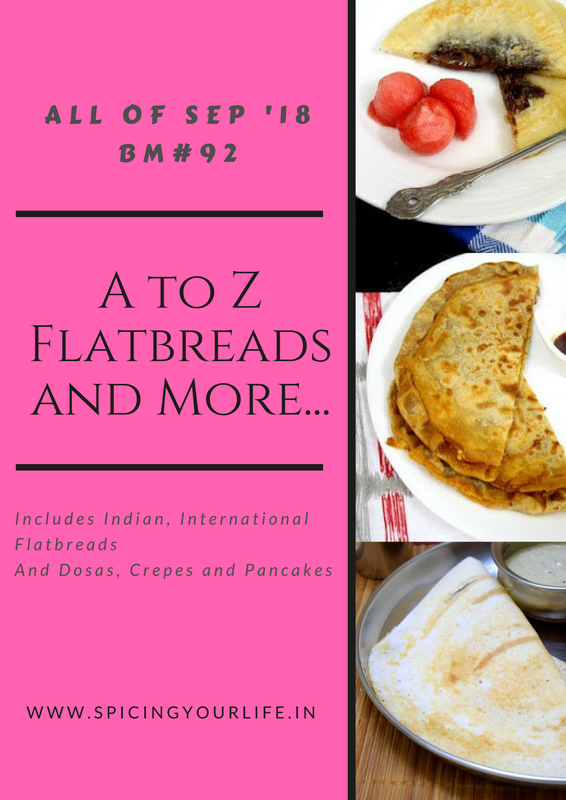 A to Z Flatbreads & More….. It is that time of the year again when our Blogging Marathon group gets together to blog for the entire month. 26 flatbreads for 26 alphabets for 26 days. It is such an exciting time for us. As usual, I was pretty excited to bake some breads for this theme but this time my family protested and simply refused to eat breads that frequently. I tried to convince them in multiple ways but they wouldn’t budge. So I gave in and confessed that I had the option to make dosais too. You should have seen the delight on their faces when I said that. They agreed to eat dosai for as long as I asked them to and even volunteered to help me make them and click pictures. Whatay family! It has also been a long time pending project of mine to blog about the various dosais I make and come up with during any breakfast or dinner crisis. My favorite line has always been -“Anything can be a dosai” and I guess it is time to put that into some practical use. So join me in celebrating Dosais from across the country for the whole month of September and let me know what else can be ‘dosaified’.